Detroit Rock City is a 1999 American comedy film directed by Adam Rifkin and written by Carl V. Dupré. It tells of four teenage boys in a Kiss tribute band who try to see their idols in concert in Detroit in 1978. Comparable to Rock 'n' Roll High School, Dazed and Confused, The Stöned Age, and I Wanna Hold Your Hand, it tells a coming-of-age story through a filter of 1970s music and culture in the United States. It took its title from the Kiss song of the same title. The film was shot at Cedarbrae Collegiate Institute in Scarborough, Toronto and other Ontario locations including Copps Coliseum in Hamilton. In Cleveland, Ohio, in 1978, four rebellious teenage boys - Hawk, Lex, Trip Verudie, and Jeremiah "Jam" Bruce - run their own Kiss tribute band called "Mystery" while they prepare to see their idols in concert in Detroit, Michigan, the following night. Their hopes, however, are dashed when Jam's religiously conservative mother discovers the concert tickets and burns them before having Jam transferred to a Catholic boarding school. Trip manages to win tickets and backstage passes from a radio contest in Detroit and the boys plan to rescue Jam from the boarding school. Disguised as pizza delivery boys, they get Father Phillip McNulty drugged from a pizza topped with hallucinogen mushrooms and set off with Jam for Detroit in Lex's mother's Volvo to pick up the tickets. While on the highway, they get into a road rage incident with disco fanatics Kenny and Bobby after Trip accidentally throws a slice of pizza on their windshield. They beat up the disco duo and continue their journey before picking up Christine, who walked out on Kenny due to his behavior. Upon their arrival in Detroit, the boys discover that Trip did not stay on the phone long enough to give the radio station his information, forcing the station to give the tickets to the next caller. After discovering that the Volvo has been stolen, they split up to find Kiss tickets and meet up in an hour and 45 minutes. Hawk finds a scalper who suggests he enter a male stripping contest to raise money for tickets. He gets drunk and loses the contest, but is offered payment for company by an older woman named Amanda Finch. After being paid, he locates the scalper, only to find out that his tickets are sold out. Trip goes to a local convenience store in hopes of mugging a younger child for his ticket, but is confronted by the boy's older brother, Chongo, and his friends, who threaten him for $200. He then plans to rob the store with a Stretch Armstrong doll disguised as a gun, but ends up thwarting a real robbery attempt and is rewarded $150. Trip gives the money to Chongo's gang, but they beat him up and steal his wallet in the process. Lex sneaks backstage with the concert loading crew, but is caught and tossed over a fence where he encounters a group of vicious dogs. He wins them over with a Frisbee and saves Christine and the Volvo from two car thieves at a nearby chop shop. Jam encounters an anti-Kiss rally and is spotted by his mother, who forcibly takes his drumsticks and drags him to a nearby church for confession. There, he is seen by Beth Bumstein, a classmate who is in the process of moving to Ann Arbor. After admitting their feelings for each other, they make love in the confessional booth before parting ways. Jam, imbued with new confidence, goes back to the rally and angrily berates his mother for her domineering ways and her hypocrisy, telling her that constantly shoving her extreme religious views down his throat has done nothing but cause him to despise religion and he demands his drumsticks back. She does so and apologizes to him, remarking to the crowd, "They grow up so fast". When the boys meet up empty-handed, they decide to beat each other up to make it appear that they had been mugged of their tickets. Upon arriving at Cobo Hall, the guards are skeptical, but Trip points out Chongo's gang, who are just entering, as the culprits who assaulted them. When the guards find Trip's wallet with his Kiss Army picture ID and money, they confiscate Chongo's tickets along with it and give them to the boys. Astonished and elated, they enter the concert hall as Kiss plays the title song of the film. As it ends, Peter Criss throws a drumstick and Jam catches it with joy and excitement. The film opened in 1,802 theaters on August 13, 1999 and earned $2,005,512 in its opening weekend, ranking number 13 in the domestic box office. By the end of its run, it had grossed only $4,217,115 with an additional $1,608,199 from international sales, bringing its worldwide total gross to $5,825,314. Against an estimated $17 million budget, it was a box office bomb. The film has a cult following from rock fans and Kiss fans alike. The film received mixed reviews from critics. Review aggregator website Rotten Tomatoes shows that out of 39 reviews, it has a 46% rating. On Metacritic, it has a 33/100 rating based on 18 critics, indicating "generally unfavorable reviews". The film was released via VHS and DVD on December 21, 1999. DVD special features include four audio commentaries (director Rifkin, selected cast and crew members, and all four original Kiss members), deleted scenes, multi-angle views of the Kiss concert, an instructional segment featuring a step-by-step guitar lesson for "Rock and Roll All Nite", original screen test footage, and DVD-ROM features. In December 2007, the film was re-released on DVD as an exclusive bonus fifth disc contained within Kissology Volume Three: 1992–2000. It was only available with initial pre-orders sold during VH1 Classic's 24 Hours of Kissmas weekend marathon. The film was released on Blu-ray in April 2015, containing additional special features not in the original DVD release. The soundtrack was released on August 3, 1999 by Mercury Records. The soundtrack does not feature all of the songs in the film. For example, there are tracks from UFO in the film that do not appear on the soundtrack. Part of the songs "Come Sail Away" by Styx and "Whole Lotta Rosie" by AC/DC are also featured in a scene. ^ "DETROIT ROCK CITY (15)". British Board of Film Classification. July 13, 1999. Retrieved March 15, 2015. ^ a b c "Detroit Rock City (1999)". Box Office Mojo. Internet Movie Database. Retrieved March 15, 2015. ^ Stephenson, Cliff (November 30, 1999). 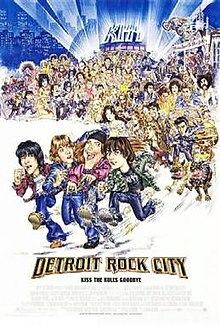 "Detroit Rock City Review". DVDfile.com. Retrieved November 14, 2009. ^ "Weekend Box Office Results for August 13-15, 1999". Box Office Mojo. Internet Movie Database. August 16, 1999. Retrieved March 15, 2015. ^ "Detroit Rock City". Rotten Tomatoes. Flixster. Retrieved March 15, 2015. ^ "Detroit Rock City". Metacritic. CBS Interactive. Retrieved March 15, 2015.